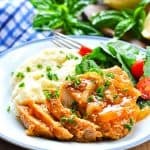 Tender and juicy, these Crock Pot Smothered Pork Chops are truly the BEST slow cooker pork chops ever! In a bowl, whisk together ketchup, broth, Worcestershire sauce, brown sugar, salt, chili powder, and ground mustard. Set aside. Pat pork chops dry with a paper towel. Season both sides of the pork chops liberally with salt and pepper. Heat about 1 tablespoon of oil in a large skillet over high heat. When hot, add the pork chops to the skillet. Sear both sides of chops over high heat (about 3-5 minutes per side), and then transfer to slow cooker. Pour sauce over the pork chops and add onion on top. Cover and cook on LOW for about 4-5 hours or on HIGH for about 2-3 hours. Cover and cook on LOW for about 6-7 hours or on HIGH for about 3-4 hours. You know that the pork chops are done when they reach an internal temperature of 145 degrees F.
Serve pork chops smothered in onions and sauce, and garnished with a squeeze of lemon juice and chopped fresh parsley. If you want to prepare these smothered pork chops in the oven, simply transfer the browned pork chops to a baking dish. Pour the sauce over top, add the sliced onion, and cover with foil. Bake in a 325-degree F oven for 40-45 minutes (for boneless chops). You can also simmer these pork chops in a skillet on the stovetop. To do so, brown the chops in a large skillet, pour the sauce over top, and add the onion. Place a lid on your skillet and simmer, covered, over LOW heat for 40-45 minutes (for boneless chops).